Yesterday, we had seen how one can set the execution order of triggers in Oracle 11g i.e. if there is more than one trigger on a table, how can one set the execution order for those. In today’s post, we will look at the same functionality in SQL Server. SQL Server has this support in both SQL Server 2000 as well as SQL Server 2005. It makes use of the system stored procedure: sp_settriggerorder. Using sp_Settriggerorder stored procedure, we can define the execution order of the trigger. Here is the syntax for SQL Server 2005, taken from BOL. For complete explanation of syntax, please look at BOL. We are interested in the second parameter: “order”. It can take three values which means that it can take into account up-to three triggers. None – Trigger is fired in random order. The same procedure is available in SQLServer 2000 also but without namespace parameter because it does not support DDL triggers. 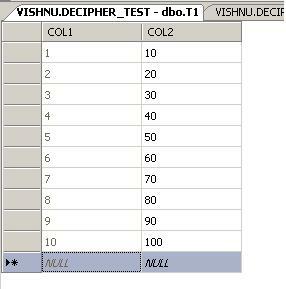 Since SQL Server 2005, supports DDL trigger, namespace parameter defines the scope of the DDL trigger whether at Database level or at Server level. If value is NULL, trigger is a DML trigger. We will use the same example as shown in yesterday’s blog. Connect to database using Management Studio. Create following table..
Now we will create two DML triggers on the table. Now let us insert the record in the table and examine the result. It is apparent from the result that TRI_TEST_2 got executed first at which point value of COL2 was null and as a end result, COL3 contains null value. Let us now define the trigger order so that TRI_TEST_1 executes first and TRI_TEST_2 executes after TRI_TEST_1. After executing above mentioned command, insert new record and check the result. We are displaying both the records for comparison. With the pre-defined execution order of the trigger, all the columns are populated correctly. Similarly we can set the firing order for the DDL triggers as well. • For a single table, we can define only one first and last trigger for each statement. • If trigger is modified using ALTER TRIGGER statement, priority of the trigger is set to None so it is very important to re-execute the sp_settriggerorder stored procedure to reset the correct execution order. • If ‘FIRST’ or ‘LAST’ trigger already exists for the statement Type, reassigining new trigger to be the ‘FIRST’ one will result into an error. How do we know whether any ordering is defined for the trigger or not? We can use objectproperty() function to retreive this information. Here is the query and the result. Similarly we can check for ExecIsLastInsertTrigger property to see whether last trigger is defined for insert statement or not. We are all aware that we can write multiple triggers on a single table based on the business requirement(s). One can have ‘BEFORE INSERT’ trigger on the table to generate a running number and on the same table there can be an ‘AFTER UPDATE’ trigger to calculate new value for another column. We can even define more than one trigger of the same type i.e. multiple ‘AFTER UPDATE’ triggers or multiple ‘BEFORE UPDATE’ triggers. Normally execution order is determined by the type of the trigger. Oracle executes all triggers of the same type before executing trigger of different type. But what is the order of execution in case when there are multiple triggers of the same type? How do we know which trigger will be executed first? Prior to 11g, there was no sure answer for this type of situation. Any one trigger (if they are of the same type) can get executed first and there is no guarantee that triggers will be executed again in the same order. This can create issues with the data. In 11g, Oracle introduced ‘FOLLOWS’ clause to control the execution order of the triggers when they are of the same type. Connect to SQL*Plus or SQL*Developer and create following table and sequence. Now we will create two ‘BEFORE INSERT’ trigger on the table. It is very clear from the result that trigger TRI_TEST_2 got fired first. 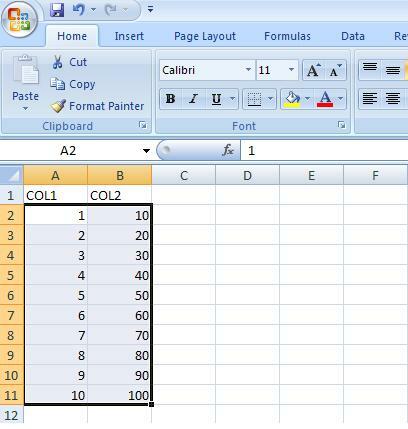 As a result COL2 value remained null because value for COL1 is not populated at this time. Thus unordered execution of the trigger can lead to wrong results. To avoid this we can use ‘FOLLOWS’ clause. Let us rewrite the TRI_TEST_2 trigger so that it gets executed after execution of trigger TRI_TEST_1. Here is the revised code. After re-creating trigger, again insert record into the table using previously used insert statement and check result. Now, we see that COL2 is correctly populated as execution of trigger TRI_TEST_2 followed the execution of trigger TRI_TEST_1. It is very clear from the example above that if we have multiple triggers of the same type on the same table, Oracle executes it randomly unless ‘FOLLOWS’ clause is specified for ordered execution of triggers. Same functionality is available in SQL Server as well and we will blog that tomorrow. 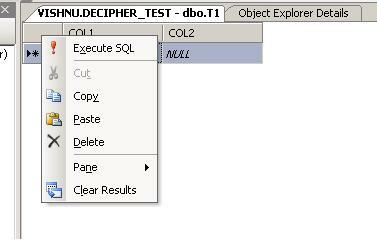 In SQL Server, getting the current SQL statements that are being executed by the active sessions is quite easy. In prior versions, one either had to make use Enterprise Manager or had to use DBCC INPUTBUFFER (<spid>) in order to get that information. In newer versions, one can just make use of the ::fn_get_sql() function. This was first introduced in SQL Server 2000 and is much better than the DBCC command since there are no text limitations. Prior to Oracle 11g, disabling triggers used to be a two step process. Triggers were automatically created in an ‘enabled’ state. To disable it we had to disable it using the DISABLE clause of the ‘ALTER TRIGGER’ or ‘ALTER TABLE ‘ commands. In Oracle 11g, we can specify ‘DISABLE’ clause in trigger definition it self. In the absence of the ‘DISABLE’ clause, the trigger is created in an ‘ENABLED’ state. Following is the script to create table and then create trigger in disabled state. Let us create a trigger now. Trigger will be created successfully. We can verify the status of the trigger using data dictionary view user_triggers. Even though trigger is created in a disabled status, Oracle will make sure that it does not have any compilation errors. Trigger will be compiled with errors if we try to reference non-existent column in the trigger. This feature can be very useful when we want to enable trigger at later stage for a specific events and as mentioned earlier, we can avoid extra step of altering the trigger after creation. We have blogged in the past about the data extraction and loading (exports and imports) methods in Oracle, SQL Server and DB2 LUW and the pros and cons of those different methods in terms of performance as well as maintenance etc.. At times during the QA or Development process, there is a need to load some data quickly for test cases. Under such circumstances, going through the scripts or the wizards could be a time consuming thing for users who are not that technical. Here is an alternative option that is available in SQL Server Management Studio (SSMS) in SQL Server 2005. This is just a quick copy/paste method of getting the data into the table in SQL Server 2005. Last night, at one of the client sites, a quick piece of code needed to be written which would take care of grouping the same cases (physical boxes) with the exact same set of SKUs together. It was a simple bit of SQL in the overall complex algorithm which decides how the cases are packed and shipped. Below is a small explanation of the issue and a short snippet of code to resolve it. The intent of the code was to group C1 and C2 together since both of them had S1 and S2 as the SKUs in them. Likewise, C3, C5 and C6 would be grouped together since they have S1 and S4 as the SKUs. While C4 and C7 will be totally separate since the SKUs that the “EXACT” combination of SKUs that exist in them do not exist in any other case. There are many ways of doing that – key thing to keep in mind is that not only the number of SKUs need to be the same, the SKUs should match up exactly. There are other ways to accomplish this as well but the above was performant enough for the requirements. Needless to state, there was additional filter criteria and conditions in the SQL that was used. 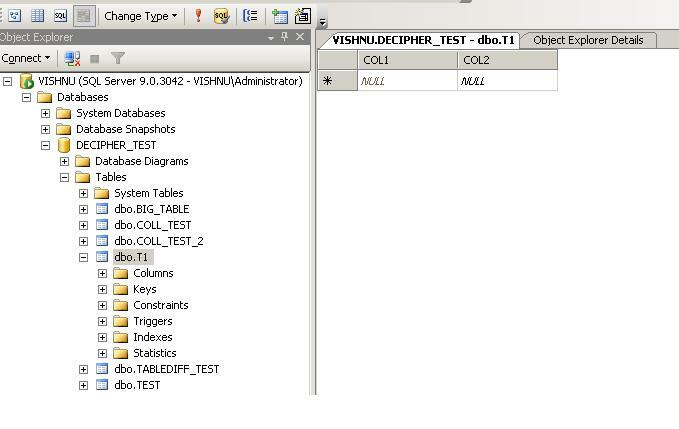 Here, the USERA and USERB are two separate users on two separate databases and the copy command is being used to copy over the data in TABLEA from USERA on one database to USERB on another database. It assumes that the structure of the tables is exactly the same. One can specify the filter conditions that they want and whatever form or shape of query they want to specify when copying over the data from the remote database. In 10g and above, one should make use of the data pump commands: expdp/impdp since COPY command has been deprecated.